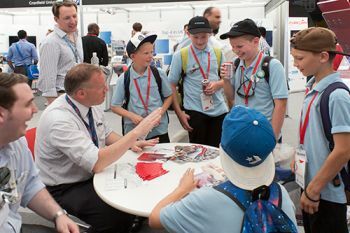 Schoolchildren, prospective students and alumni visit the City stand during the Farnborough International Airshow. 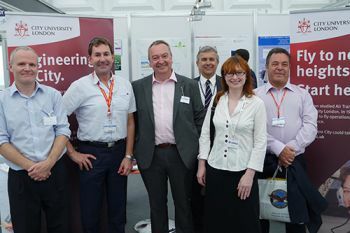 The City University London stand (located in the Innovation Zone) was a hive of activity during last month's Farnborough International Airshow (14th to 20th July). Alongside course brochures and other promotional materials, the stand also displayed the 'hairy wings' research being carried out by City's aeronautical engineering academics. 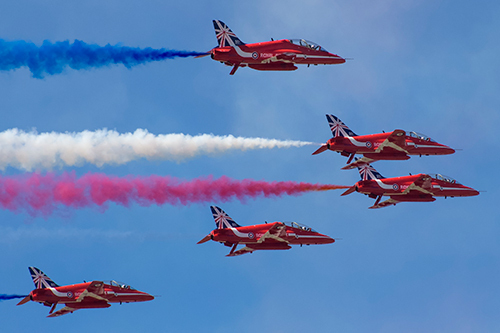 The Farnborough International Airshow combines a major trade exhibition for the defence and aerospace industries with a public display of aerobatics. 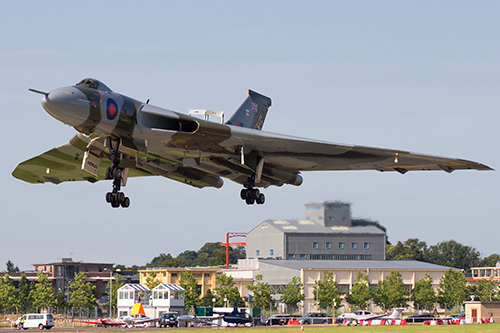 The show started out as the annual Royal Air Force (RAF) Airshow at Hendon from 1920 to 1937. After World War II the show moved to Radlett until it relocated to its present location in Hampshire in 1948. Due in large measure to the significant contribution of aviator and aircraft innovator, Sir Frederick Handley Page, City's predecessor the Northampton Institute was the first higher education institution to teach aeronautical engineering in the UK. During the airshow, City alumni (Chris Shephard, Captian Khaldoon Nasser, Jim Evans, Douglas Whittaker, Penny Barltrop and Mark Kreckler) on the BSc Air Transport Engineering programme (1980-1984) were reunited with each other. "Given the location of our stand in the Innovation Zone, we were able to attract a lot of footfall and enquiries from a broad range of people, including schoolchildren and many who were interested in our UG and PG offerings. It was a very successful event and I wish to thank everyone who was involved in staging this successful showcase." Please visit this link for further information on City's aeronautical engineering courses.